Foxconn Sharp intends to build LCD fabs in US: but is it practical? Since the end of 2016, when Foxconn Sharp announced its new Gen 10.5 fab investment in Guangzhou, China, the “fabs in America” plan has been on the table in the meeting rooms of both companies. Gen 10.5 is ideal for glass substrates in the 2940 x 3370 mm size, allowing the production of eight 65-inch LCD panels or six 75-inch panels. As we analyzed in the IHS Technology Blog: LG Display weighs options with Gen 10.5 for AMOLED television panels, Gen 10.5 is in much more efficient in producing larger-sized LCD TV panels than Gen 8, especially on the 65- and 75-inch sizes. Foxconn, headquartered in Taiwan, is the world’s largest contract manufacturer, counting a glittering client roster that includes global brands such as Apple, Amazon, Microsoft, Sony, Nokia, and Nintendo. Early last year, Foxconn bought Japan’s Sharp, which had been hemorrhaging sales and revenue, for $6.2 billion. Now a new development could potentially send tectonic tremors throughout the display manufacturing landscape. In our observations, we now believe that Foxconn Sharp is seriously considering the establishment of LCD fabs in the US—an unheard-of move that departs from the industry’s traditional model of centralizing display-panel manufacturing in Asia. Moreover, the decision is about to be made within the next couple of months on the long-term investment in the US required by just such a move, as well as the ramifications involved. For decades, the display panels have all been made in the Asia, originally in Japan and South Korea, and now in Taiwan and China. Whether it was LCD or OLED being made, in place were complete component supply chains, operational equipment and facilities, established know-how, and even viable financial models that took into account available opportunities, such as government subsidies from China, in order to boost the company’s bottom line. Overall, the working model for the longest time for the display industry is to have display panels made in Asia, the original equipment manufacturer (OEM) or original design manufacturer (ODM) located in Asia, the final assembly conducted in a specific region but with assembly sites to be found in various parts of the world, and then brands and retailers selling the products globally. In other words, display manufacturing has always been very Asia-centric. In the latest Display Supply Demand & Equipment Tracker, IHS Markit is projecting that by the end of 2019, China will account for 45% of the global manufacturing capacity of TFT—or thin-film transistor--LCD panels, to be followed by Korea with 26%, Taiwan with 23%, and Japan with 6%. Until now, it has never been on the agenda for existing display makers to build TFT LCD fabs in the US. A Gen 6 TFT LCD fab in Michigan, which will be applying oxide TFT LCD technologies for high-resolution-, low-frequency panels, aimed at display applications for mobile PCs, smartphones, and automotive. A Gen 10.5 TFT LCD fab somewhere in the Great Lakes region, in the states of Wisconsin, Ohio, Illinois, or Michigan, among others. Here the technology to be used will be a-Si—or amorphous silicon—TFT LCD for 4K/8K high-resolution and super-large-screen LCD TVs. Investment from Sharp, according to estimates, will total some 800 billion yen (US$7.2 billion), likely taking place in either Michigan or Wisconsin, which were key states won by Donald Trump that catapulted him to the presidency in US elections last year. Why Gen 6 oxide? 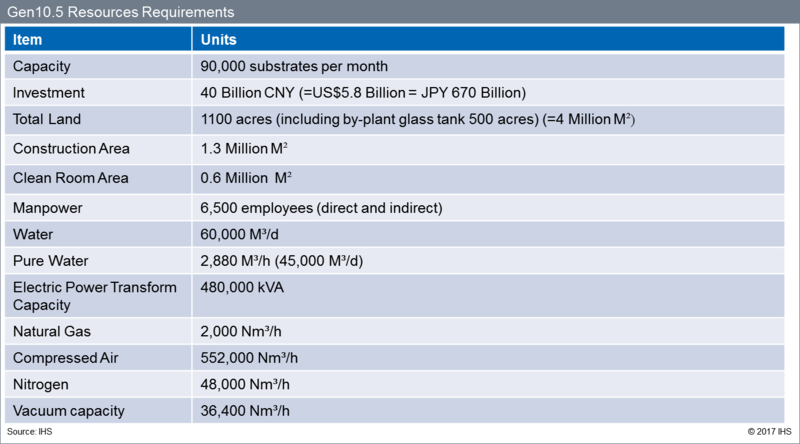 From a capacity expansion perspective, it makes sense for Foxconn Sharp to increase its oxide capacity for mobile and automotive displays. This is because Sharp is the leader in oxide TFT technology, and oxide is becoming the leading display technology for mobile PCs, such as on the Apple iPad and Microsoft Surface. Sharp is working hard on implementing oxide technology, with the technology’s comparatively good variable-frequency driving, low-power consumption for use in the high-resolution feature of displays in smartphones, virtual and augmented reality, and automotive. Gen 6 is also an optimum fab scale for producing panels smaller than the 10-inch size. According to the latest Display Long-Term Demand Forecast Tracker, the demand area for oxide TFT LCD is expected to grow from 1.2 million square meters in 2015 to 17.7 million square meters in 2024. And why Gen 10.5? From a market demand perspective, both the 65- and 75-inch are the fastest-growing segment in LCD TVs, and the US is a promising market for these super-large-sized LCD TVs. And despite the specter of panel oversupply possible during the 2019-20 period because of the aggressive Gen 10.5 capacity build-up in China, display makers on the whole believe that more Gen 10.5 capacity is needed to meet the market’s hunger for super-large-sized televisions. In particular, the 60-inch-and-above TV segment in North America market is projected to grow from 4.2 million units in 2015 to 9.5 million units in 2021, according to the TV Set Intelligence Service. Is Foxconn Sharp too aggressive in expanding capacity, not only in Asia but now even in the US? Foxconn’s agile manufacturing and efficient supply chain have been put to good use to support Sharp. Shipments of Sharp TVs, which amounted to 4.7 million units in 2016, are now targeted to reach 12 million to 14 million units this year, according to the TV Display Intelligence Service, as shown in the table below. To maximize LCD capacity utilization, Foxconn Sharp has stopped supplying LCD TV panels since the beginning of this year to other TV brands. To boost Sharp’s shipments, Foxconn has launched a series of aggressive and bold promotions in China, such as a “buy one-get one free” LCD TV (the famous so-called Sky Tiger promo). To rekindle relevance to today’s market and for new apps, Sharp is pursuing new partnerships. At the recent SID Display Week industry event, Google indicated it would work in partnership with Sharp for Google VR/AR devices. New investments into Sharp, including for OLED panels in Sakai, Japan; as well as for a new Gen 10.5 TFT LCD fab in Guangzhou, China, are being readied to support Sharp’s panel demand for the long term. It makes sense, then, for Sharp to stage a comeback, and with Foxconn’s astute management, Sharp can continue to grow to provide more panel capacity. And because Sharp’s LCD technology is still considered one of the world’s best—Chinese display manufacturers, up-and-coming in the world, are no match—it makes sense as well for Foxconn to expand Sharp’s capacity, rather than to let the Chinese surpass the company or gain the upper hand. 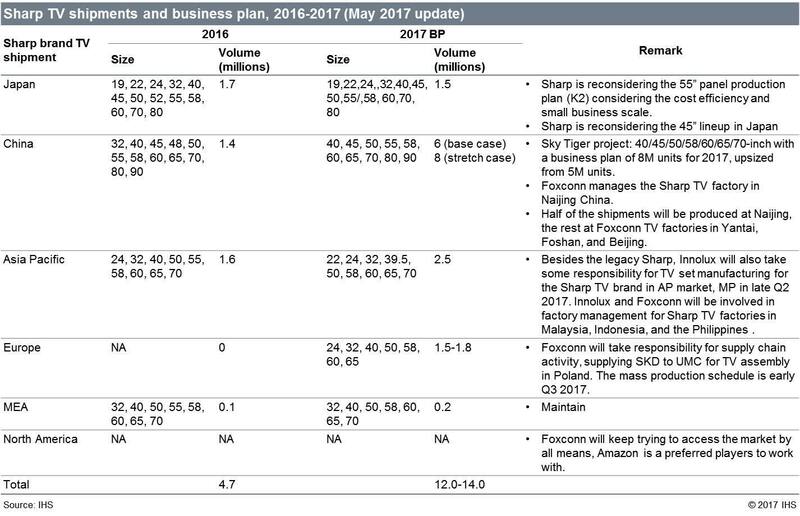 If Foxconn Sharp goes ahead and builds its Gen 10.5 fab in the US, it will be the sixth Gen 10.5 fab in the world overall from various manufacturers that either have been announced or are already under construction, as shown in the table below. Such a development may constitute fresh cause for worry over future or potential concerns of global overcapacity in display manufacturing, especially once all Gen 10.5 fabs ramp up. However, the bigger question is this: is a “Made in USA” display panel a practical idea at all? In the table below IHS Markit analyzes this question, noting the various elements involved in manufacturing display panels at a US-based fab, and whether the corresponding effects might be positive or negative. China’s Hisense in the US until 2020. An important question for Foxconn will be how to conform to US environmental standards. A Gen10.5 fab, with its gigantic glass substrate capacity, consumes huge amounts of water, gas, and chemicals. Toxic byproducts from the manufacturing process, if not handled well, can have a catastrophic effect on the environment. Asian panel makers have learned much on how to handle waste or recycling in the course of many years of operations, and it will be necessary to replicate and transfer such know-how to the US for any fabs built here. The following figure shows the massive amount of resources needed to run a Gen 10.5 fab. All told, it makes sense for the Foxconn Sharp group to build fabs in the US, given the growing demand for panels by both the global and US markets, and also for the company to expand its business. Having a US-based LCD fab could also gain Foxconn a measure of political goodwill, since the investments that are needed will stimulate local employment and economics. On the other hand, such a move is rife with challenges—among them the substantial use of natural and human resources alike, as well as the painstaking process of building a supply chain from the ground up. With Foxconn Sharp showing strong intent to build LCD fabs in the US and to start its planning process, alignment will be important for the multiple parties involved—for Foxconn; the US government; Asian-based equipment and supply chain companies; the US TV market; US states like Michigan and Wisconsin, where the fabs are purported to be built; and even China, which might need to be appeased, in the face of industry speculation that Foxconn’s intended fab in the US appears to be bigger than the fabs being built in China. What is certain is that with Foxconn’s ambitious move, the global display and TV industry may never be the same again. Stay tuned to IHS Markit, as we provide more insightful analysis and updates on this unfolding development.